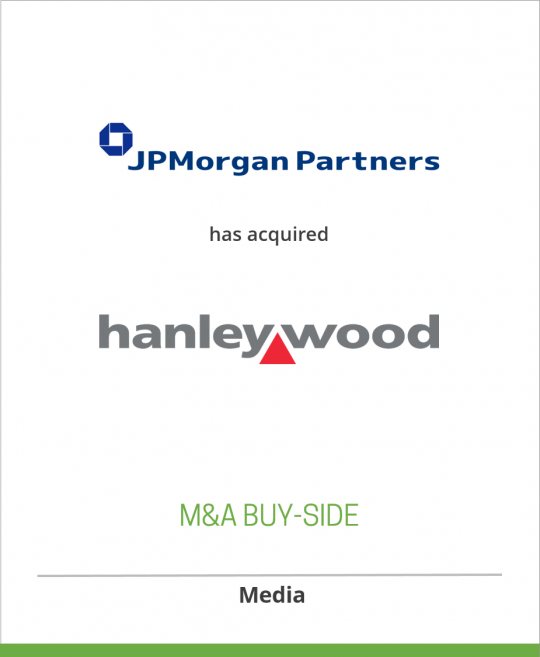 JPMorgan Partners has acquired Hanley Wood, LLC, the leading media company serving the residential and commercial construction industries, from Veronis Suhler Stevenson. Hanley Wood, LLC, founded in 1976 and based in Washington, DC, is the premier media company serving housing and construction and one of the ten largest business to business media companies in the U.S. Through five operating divisions, the company produces 22 magazines, 17 Web sites, 15 trade shows and events, rich data and custom marketing solutions. The company also is North America’s leading provider of home plans. For additional information: (www.hanleywood.com). Veronis Suhler Stevenson (VSS) is a private equity and mezzanine capital fund management company dedicated to investing in the media, communications and information industries in North America and Europe. To date, VSS equity funds have invested in 35 platform companies, which have in turn completed over 185 add-on acquisitions resulting in a portfolio with realized and unrealized enterprise values totaling approximately $7.5 billion. For additional information: (www.vss.com). JPMorgan Partners, LLC (JPMP) is a leading private equity firm with over $12 billion in capital under management as of March 31, 2005. Since its inception in 1984, JPMP has invested over $15 billion in consumer, media, energy, industrial, financial services, healthcare, hardware and software companies. With approximately 95 investment professionals in six principal offices throughout the world, JPMP has significant experience investing in companies with worldwide operations. JPMorgan Partners is the private equity arm of JPMorgan Chase & Co. (NYSE: JPM), one of the largest financial institutions in the United States, and is a registered investment adviser with the Securities and Exchange Commission. For additional information, please visit the website at www.jpmorganpartners.com.